The modern space adds chic charm to this on-the-bay contemporary dining spot. Breakfast & Brunch Sat.-Sun., Lunch Tues.-Fri., Dinner Tues.-Sun. : Back Bay Bistro, formerly called Back Bay Café, targets a hipper Newport crowd in this incarnation, with its modern décor and more contemporary cuisine. 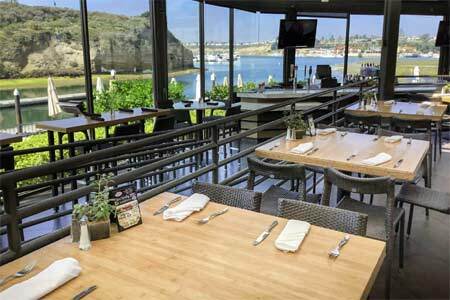 Located at the boat launch ramp on Newport's scenic Back Bay as part of the Newport Dunes Resort, the restaurant shines with its huge white marble bar, giant picture windows, retractable roof, classic dark wood tables and sophisticated wicker weave chairs. Bruno Massuger is the chef. Start with the tower of hand-cut ahi with avocado or steamed littleneck clams in a white wine butter sauce. Or go for the duck rillette with pickle vegetables and stone fruit hoisin sauce. While the seafood chowder is a house specialty, think about trying the nicely spiced and creamy lobster bisque. Main courses have included macadamia pan-seared branzino, salmon with beer and bacon sauce, New Zealand rack of lamb and filet mignon with blue cheese or peppercorn sauces. For dessert, consider the feeds-a-table-of-four chocolate "thunder" cake. The wine selection is rather good, as are the by-the-glass options.